These are some of the objects, events and others using the name Hatfield. Battle of Hatfield – regarded by the Venerable Bede (born some 40-years later) as a battle between Christians and Pagans. However, King Penda of Mercia (Pagan) fought King Edwin of Northumbria (Christian) with the help of King Cadwallon of Gwynedd (Christian), so it appears more of a territorial than theological dispute. The year of the battle is unclear with some sources giving 633 AD and others 632 AD. The combined forces of Penda and Cadwallon invaded Northumbria and Edwin was killed in battle, which took place in October at Hatfield Chase, South Yorkshire. Although there is some confusion as to exactly where as accounts were few (and written several years later) and boundaries have changed. Hatfield and McCoy Feud – long-running, legendary feud between two American families that started in the late 1800s (one source suggests 1878). The actual cause of the start of the dispute between the Appalachian mountaineer families on opposite banks of the Tug Fork stream is unclear. William Anderson Hatfield (also known as Devil Anse Hatfield) led the Hatfield family, while Randolph McCoy (also known as Rand'l McCoy) led literally the other side – as the Hatfield side of the stream came under Logan County, West Virginia; and the McCoy side under Pike County, Kentucky. The American Civil War (Confederate Hatfield vs Unionist McCoy) added an added dimension. The first recorded fatality was Ellison Hatfield shot in a brawl, which led to the revenge killing of Tolbert McCoy, Phamer McCoy and Randolph McCoy Jr in 1882 (another source suggests Harmon McCoy in 1875). Friends and neighbours took up opposite sides of the bitter quarrel (although there was reported to be a Romeo and Juliet style romance between Johnson Hatfield and Rose Anna McCoy before the killings but her family is said to have put a halt to it). The dispute rumbled on with occasional flare ups of violence and legal disputes. One source suggests the initial feud ended in 1891. However, the events of 11 September 2001 (9-11) led to a formal declaration of peace signed on 14 June 2003 (although the families had shaken hands in 1976). It was broadcast on tv, and their respective state governors also acknowledged the event. The once-warring families apparently now celebrate their common heritage with joint reunions (with numbers of 2,500-3,000). Hatfield & The North – band formed in 1972 which made a name for itself on the 'Canterbury' music scene. It took its name from motorway road signs (referring to this Hatfield – historically once an important stop on the Great North Road. However, although there were Hertfordshire origins, they are not known to have any links to the town). Comprised of Phil Miller, Pip Pyle, Richard Sinclair and Dave Stewart (who replaced Steve Miller, and later enjoyed chart success with Hatfield-born Barbara Gaskin), they were best known for their 1974 album, The Rotters' Club. The band was short lived (splitting up in 1975) but they have since set up their own record label, Hatco, and released two retrospective collection CDs (Hatwise Choice and Hatitude). They did briefly reform for some gigs but that ended when Pip Pyle died in August 2006. Hatfield Cabinet – name given to an item of furniture with a lead glazed display area on top with two inner shelves and a base cupboard with a single shelf. It's not clear from some of the listings whether they are referring to historic pieces by a manufacturer (see Hatfield Restorations); or whether it is being used as a generic name for a style of cabinet; or if a manufacturer is using it as a stylish range name. Hatfield Memorial Lecture – annual memorial lecture in memory of Dr William Herbert Hatfield, a distinguished metallurgist, who died in 1943. The lecture, usually held in December, is hosted by the University of Sheffield (where he studied). The 60th memorial lecture will be given this year (2012). Hatfield Trailer Motor Fire-Pump – In 1921 Merryweathers introduced the trailer motor fire-pump. Basically, a 35 hp motor engine and a Merryweathers Hatfield pump on a two-wheeled carriage with wide-rimmed wheels and soft tyres to allow it to cross soft ground. It has a steel tube drag handle with a crossbar (to move it around) with an 'eye' at the end to attach it to another vehicle to tow it. 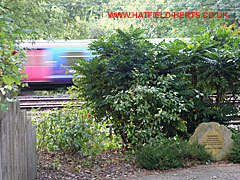 Hatfield Train Crash – at 12:23 on 17 October 2000, the 12:10 Kings Cross to Leeds, GNER (Great North Eastern Railway) express, travelling at 115 mph, derailed after a neglected, cracked rail disintegrated on the bend before Hatfield station in Hertfordshire. Four people were killed, 4 seriously injured, and 66 suffered less serious injuries. It was the latest in a series of rail accidents and triggered a massive shake up of the British rail network and how it was managed. A permanent memorial and mini-garden has been erected by the side of the railway line on the fateful bend in memory of those killed: Robert Alcorn (37), Steve Arthur (46), Leslie Gray (43), and Peter Monkhouse (50). Picture of the memorial garden above. USS Hatfield (DD-231) – US Navy Clemson-class destroyer launched in 1919 after WWI but still in service during World War II. Named after John Hatfield, a US Navy midshipman on USS Conquest, killed in action on 27 April 1813 in the Battle of York (during the War of 1812 – between the US and British Canada, which lasted 1812-15). William D Hatfield Award – a WEF–PNCWA Award (Water Environment Federation and Pacific North West Clean Water Association). PNCWA is a member of WEF which is a not-for-profit association that provides technical education and training for water quality professionals who clean water and return it safely to the environment (originally founded in 1928 as the Federation of Sewage Works Associations). The award commemorates Dr William D Hatfield, Superintendent of the Decatur, Illinois Sanitary District. Also President of the Central States Sewage Works Association (1944-45) and President of the Federation (1958-59).